The Plant of the Month for October 2016 is Eucalyptus porosa F.Muell. ex Miq. 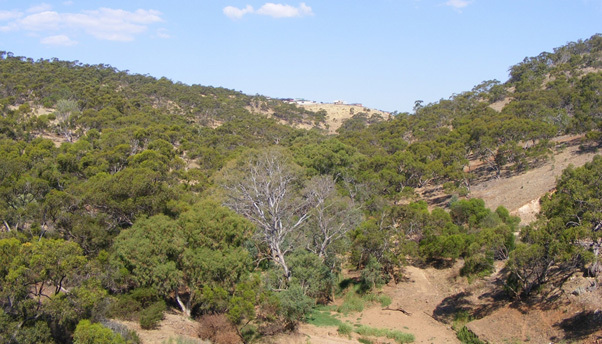 (mallee box), the dominant eucalypt in DEWNR’s Park of the Month, Cobbler Creek Recreation Park. Mallee box, Eucalyptus porosa, dominates the hillsides of Cobbler Creek Recreation Park, with red gum, E. camaldulensis, growing along the creekline. Photo: Peripitus (CC BY-SA 4.0) from Wikipedia. Mallee box is part box (a general name for a Eucalypt with rough flaky bark) and part mallee due to its well-developed lignotuber and frequent multi-stemmed habit. Under optimal conditions though, it is often a single-trunked, rather twisty and spreading tree. Mallee box can be distinguished from other boxes in SA by the colour of its foliage: a fresh “yellow-ochre green” rather than grey-green. Eucalyptus porosa foliage. Photo: Clive M. Chesson. Eucalyptus porosa mostly occurs within South Australia, and although sometimes overlooked, it is a very characteristic feature of many of our landscapes, particularly on the sheet limestone soils of Eyre and Yorke Peninsulas. It also grows in clay-loam depressions in the Murray Mallee and upper South-East regions, on rocky hillslopes in the Flinders Ranges, and confined along drainage lines in more arid areas. In the Adelaide region it is localized on dryer sites of the hills-face escarpment from Cobblers Creek to Skye and further south near Marino. Several remnant trees also persist on the edge of Adelaide city in the West Terrace Cemetery. The variety of its habitats has probably contributed to the plethora of common names: mallee box, black (or South Australian) mallee box, water (or Quorn or lerp) mallee and swamp box. 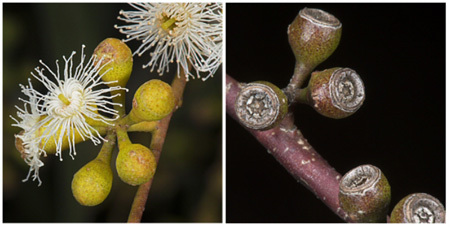 Brooker (2000) classified Eucalyptus porosa as being closely related to other boxes such as peppermint box (Eucalyptus odorata) and grey box (E. microcarpa). However, recent unpublished molecular studies by Herbarium Molecular Botanist Ed Biffin show that it is most closely related to the South Australian blue gum (E. leucoxylon) in a different group comprising species that are remarkably diverse in their bark type – smooth-barked gums, boxes and ironbarks. Significantly, hybrids between E. porosa and E. leucoxylon are frequently encountered. 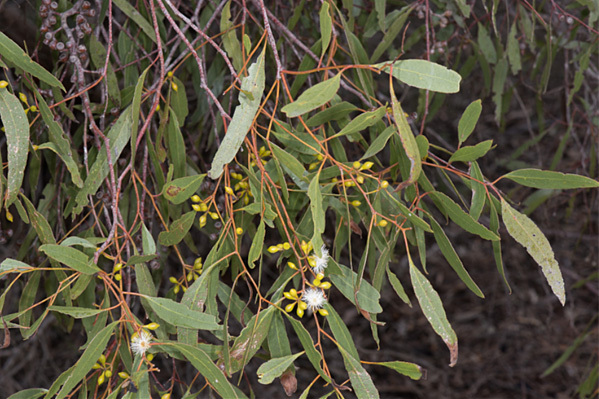 Descriptions of these and other South Australian eucalypts are available in the new Flora of South Australia (5th edition) eucalypt treatment (32MB pdf file) by Dean Nicolle. Contributed by State Herbarium botanists Peter J. Lang. This entry was posted in The Plant Press on 23 September, 2016 by Jürgen.